Dave’s Pest Control has provided homeowners and business owners with pest control services in the Worcester County area for over 40 years. Learn more. Our mission is to set the standard of superior service in the pest management industry that exceeds customers’ expectations and provides an enriching, fulfilling, and rewarding environment for employees while supporting the community. Dave’s Pest Control has been in business since 1972. Dave Penttila, Sr. started the company with little more than a handshake and a prayer. With that handshake, pest control in Massachusetts, Northern Rhode Island, and Northern Connecticut was changed forever. 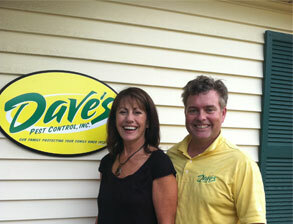 Today, Dave’s Pest Control is still family-owned and operated. Dave, Jr. has brought the company to a new level by implementing new and improved technology in combating today’s pest control challenges, including the most advanced treatments in Green Pest Control. We are committed to providing the same superior customer service and products as always. Dave’s Pest Control takes pride in the fact that many of their current regular service clients are original customers from the early years who refer their friends and family regularly. Residential and commercial clients enjoy prompt, personal service that only an independent operator can consistently provide. Learn more about our team and the community around us by visiting our friendly Pest Control Blog.